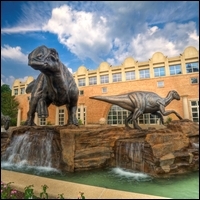 Five-story-tall dinosaurs roar onto Fernbank’s giant screen for a captivating adventure of science and discovery. See the earliest creatures of the Triassic Period to the monsters of the Cretaceous in a "life-sized" IMAX® presentation. Join renowned paleontologists as they discover new fossils and uncover evidence that dinosaur descendants are still among us. Realistic and scientifically-accurate computer generated animation brings dinosaurs back to life… in a big way!